Cat-scratch disease (CSD) is an uncommon illness that can be transmitted to people by cats. The agent that causes cat-scratch disease is a rickettsial (bacteria-like) organism called Bartonella henselae. Infected cats can transmit the illness to people even if the cats do not show any signs or symptoms of illness. Kittens younger than one are more likely to carry B. henselae. Approximately 40% of the cat population carry B. henselae. 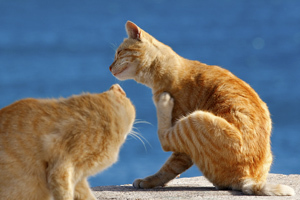 At first, the scratch or bite will be red and sore, but without pus. The wound later changes to a blister-like sore that breaks open. The sore then dries out and heals in 1 to 3 weeks. 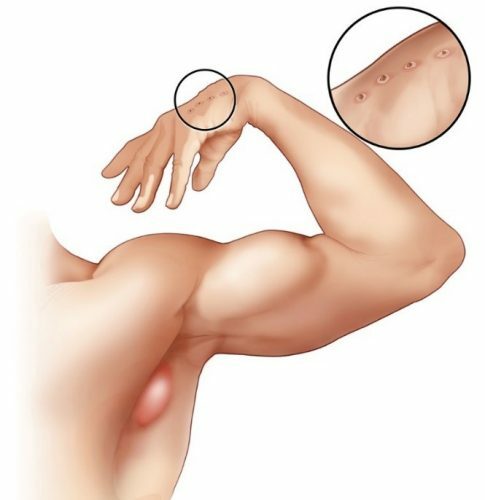 Within 2 weeks of being scratched, the lymph nodes closest to the site of the scratch may become swollen. Fever is usually present. Other symptoms include fatigue, loss of appetite, weakness, chills, aches, and a general feeling of being ill. The symptoms usually begin 3 to 14 days after being scratched or bitten by an infected cat. You can get cat-scratch disease when infected cats (usually kittens) bite or scratch the handler. You can also get it when an infected cat licks an open scrape or wound. Contact your physician if you have a wound from a cat and you suspect you have cat scratch fever. People are only tested for CSD when the disease is severe and when the physician suspects the symptoms meet the criteria. Your physician can order tests to determine if you have CSD. Your veterinarian can tell you if your cat should be tested. The illness in people is not usually serious. Most cases resolve on their own without treatment in 2 to 3 months. However, in more severe or recurring infections, complications can occur and a doctor can prescribe antibiotics to treat the disease. There is currently no vaccine available to CSD. In general, 2-6% of people carry antibodies to B. henselae indicating they have been exposed to the bacteria at some point in their life. Risk of cat scratch fever is possible for people who have contact with kittens or cats that are infected with the bacteria. Reduce contact with kittens and activities that may result in scratches or bites. Promptly cleanse any minor cat scratches or bites with soap and water immediately. For more severe wounds, consult your doctor.